Nineteen-year old conceptual artist, Sarah Dorleus, may be young, but her work already transcends limitation. Her presently poised, and mature nature is not only admirable but is also a noticeable theme of what she creates. The Brooklyn-born, ATL living student, shared with me details of her work, aspirations, and, as you will soon see, what makes her voice so distinct. gave her a strong foundation to becoming the artist she is. We exchanged island girl big ups, then an agreement to “there aren’t many of us [islanders, that is] in the art field, doing modern art” followed. Don’t get me wrong, of course, we are involved, but people from the islands are underrepresented in Sarah’s genre; one that isn’t aiming to define or representconcrete subjects, but is rooted in abstraction. And don’t be fooled by the images depicted in her portraits, even those are open spaces that everyone can explore and form personalized interpretations. So the question becomes, does culture – or for specificity, Black culture – absolutely extend to her artwork? This question isn’t easily answered, and frankly, it doesn’t have it be. Practicality, especially in regards to career plans, is equally significant to her process, along with emotions and the act itself. Take for instance, her eloquent way of coping with her ill father. She used her emotions as inspiration and produced pieces that conceptualize aging, time, life and death. “Things that are going on in my world are very relevant to when I decide to paint,” but even with this personal source, she channeled her fluctuating emotions into something abstract. Her therapeutic paintings address relatable ideas and experiences that speak directly to human circumstances, rather than isolate by race or particular experience. I relearned to appreciate inclusive art, turning common emotion into an abyss of flexibility. If it registers that logic is important to this creative, you would be correct. Sarah’s creative process is mature and analytical just as she is. When she was younger, she felt it all had to happen quickly. Like, inspiration comes; therefore I must create something now. She has since learned to spend as much time as needed to ensure the outcome justly reflects the inspiration. Feelings of accomplishment would ensue after completing a piece quickly, “but my work wasn’t as impactful as it could have been,” she says. Just another example of her unexpected level of maturity and ability to blend practicality with creativity, as a Capricorn, a sun sign we both share. *Giggles with zodiac pride* She sits on her ideas, indulge in self-reflection “just to make sure it’s solid in my head, like, I got it.” Her strategic, creative process is a key aspect of the artistic voice she has and continues to hone. 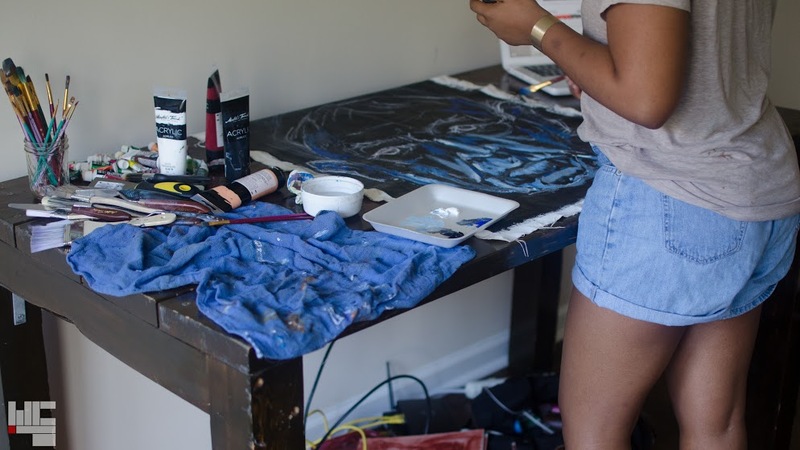 Sarah’s approach to art is preparing her for a career in teaching, exhibiting, and curating. I look forward to following Sarah on her sure to be a successful journey in the art world. Follow her on Instagram to stay up to date with her shows and new works. Visit her website for further examination of her artworks.